A4 Size 7.2 x 10.5 in. (182 x 267 mm) 8.3 x 11.7 in. A4 Mounted 7.2 x 10.5 in. (182 x 267 mm) 11 x 14 in. A3+ Size 12 x 17.6 in. (305 x 447 mm) 13 x 19 in. MEDIUM 13.9 x 20.4 in. (353 x 512 mm) 17.5 x 24 in. LARGE 20 x 29.5 in. (511 x 749 mm) 24 x 35.2 in. 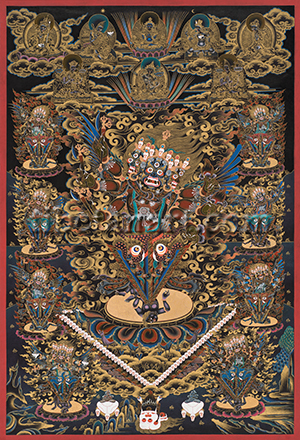 This rare gold-on black composition, painted by Chewang Dorje, depicts the assembly of the phurba-bodied deity Yamantaka (Tib. Jampal Trochu) and his retinue, a unique wrathful deity practice of the Drukpa Kagyu School that is not commonly transmitted. Yamantaka Trochu was the main personal yidam of the 8th Khamtrul Rinpoche, Dongyul Nyima (1931-1980), who in the 1970's rebuilt his Khampagar Monastery at Tashi Jong in India, after having received an auspicious vision of this wrathful form of Manjushri when he first visited this site. This special Yamantaka practice was also held by the yogin Togden Atim, who served as Tashi Jong’s main meditation teacher for twenty-five years and founded the Yamantaka Retreat Center there, where six of Tashi Jong’s thirteen Togdens now regularly perform this yidam-deity practice. Yamantaka, as the central figure, is extremely wrathful and dark red in colour, with three faces, six arms, and the lower body of a ritual-dagger or spike (Skt. kila; Tib. phurbu), with a fiery triangular blade. Each of his three ferocious faces has three round red eyes, a gaping mouth that reveals his four sharp fangs and twisting red tongue, and upward-blazing facial hair. His central face is blue-black in colour, his right face green, his left face dark red, and each face is adorned with a jewel-topped five-skull crown with hanging filigree bone ornaments. His mass of tawny hair streams upwards like fire above his topknot, which is sealed with a half-vajra and bound by a writhing serpent. With his three extended right hands Yamantaka holds aloft three vajra-marked iron axes. And with each of his three extended left hands he holds the warm and blood-dripping heart of a demonic enemy. Yamantaka’s powerful bodily form is adorned with the ‘ten attires of the charnel ground’: his forehead, cheeks and chin are respectively smeared with cemetery ash, fresh blood, and human fat. A flayed and bloody elephant-skin hangs across his back, a flayed human-skin is tied around his neck, and a tiger-skin loincloth is bound around his waist. The lower ends of the tiger-skin, human-skin, and elephant-skin billow out behind the fiery blade of his lower body, along with the ornate ends of the silk belt that fastens his tiger-skin loincloth. A long poisonous serpent coils around his neck as a sacred thread, along with a garland of fifty freshly severed and blood-dripping heads that hang on a twisted thread of intestines. He is adorned with golden earrings, bracelets and armlets; along with bracelets and armlets made from filigree bone, and a bone breast ornament that encircles his chest with a bone wheel at its centre. He abides amidst a blazing mass of awareness fire, and he possesses the mighty blue vajra-wings of a heruka or 'blood-drinking' deity, the long feathers of which are sharply pointed on his right side and sword-like on his left side. The blue blade of the triple-sided dagger that forms his lower body is fashioned from meteorite iron, with flames emanating from each of its three sides. Crowning the top of these three blades is the ferocious head of a makara or ‘water-monster’, which bites down on the blades. The fierce head of this creature has two round and angry red-yellow eyes, sharp white tusks, a scaled skin, two horns and ears, upward-blazing facial hair, and a long trunk-like snout. On either side of the phurba’s central blade are the tails of two entwined naga-serpents that the makara is devouring, with the lower part of the deity’s severed-head garland appearing in front of these entwined serpents. The sharp fiery tip of this mighty phurba pierces the heart of a demonic enemy, who has been cast down onto the deity’s golden sun-disc and multicolored lotus. This lotus rests within a brazier-like, triangular dharmodaya or ‘reality-source’, which is fashioned from a narrow upper row of haughty dry white skulls and a lower row of flames. The dharmodaya rests above an ocean of blood encircled by clouds, with other clouds appearing inside the dharmodaya itself. Amidst these interior clouds are the small figures of gods, monks and worldly beings, with four small iron-bladed phurbas standing upright at the front. Four pairs of mammals support the eight petals of Yamataka’s lotus-seat, which appear to be: wolves, bulls, camels, and buffaloes. The retinue of eight directional phurba-bodied deities that surround Yamantaka are similar in form to him, although only three of then have three faces and six arms, while the other five have one face and two arms. The phurba tips of all eight of these deities pierce through the hearts of the demonic enemies that are pinned-down on the golden sun-discs of their lotus seats. The phurba-bodied deity in the bottom left corner is white with three faces and six arms. His first two hands are crossed in front of his heart in vajra-humkara-mudra; while his other two extended right hands hold a skull-cup and a crossed-vajra, and his other two extended left hands hold a skull-cup and a blood-dripping heart. Above is a blue-black phurba-bodied deity with one face and two-arms, who holds a vajra-marked iron hook in his raised right hand, and a torn-out heart in his left hand. Above again is a red deity with a dark-red face and two-arms, holding a vajra-marked axe in his raised right hand, and a heart in his left hand. And above at the top is a light-red deity with a red face and two-arms, holding a vajra-marked iron hook in his raised right hand, and a heart in his left hand. The phurba-bodied deity in the bottom right corner is dark red with firece three faces and six arms. With each of his three extended right hands he holds a vajra-marked iron hook. With his upper left hand he makes the threatening tarjani gesture with a raised index-finger, and with each of his other two extended left hands he holds a fresh torn-out heart. Above is a blue-black deity with three faces and six arms. His main face is that of a fierce tawny-red lion, his right face is that of a squealing sow or boar, and his left face is that of a black wrathful demon. With each of his three extended right hands he holds an iron sword, while his two upper left hands make the threatening tarjani gesture, and his lower left hand holds a jewel. Above again is a blue-black deity with a black face and two-arms, who holds an iron sword in his right hand, and makes the threatening tarjani gesture with his left hand. And above at the top is a blue deity with a blue face and two-arms, who holds a vajra-marked iron hook in his raised right hand, and a torn-out heart in his left hand. Enthroned upon a lotus amidst rainbows at the top of this composition is Vajradhara, the blue 'primordial-buddha' of the various Kagyu lineages of transmission. And similarly enthroned below Vajradhara is the yellow-orange form of the wisdom-deity Manjushri, the peaceful manifestation of Yamantaka, who holds the attributes of a sword and a lotus supporting the text of the Prajnaparamita Sutra or 'Perfection of Wisdom'. In the upper right and left corners are three lineage holders of this Yamantaka transmission, with Padmasambhava at the top left.